I'm back with my last birthday giveaway! Next week I'll return to regularly scheduled programming. I have a bunch of videos I've filmed recently that I'm excited to get up. Today i'll feature a product that I discussed in my previous skincare update, here. The Sirirus Skinsonic is an alternative to the Clarisonic for a really great price. It's really changed my skin and I'm super excited to give one of you the chance to try it out. Here's a shot of my actual brush. It's a little used but you can see what it really looks like. After, my skin is exfoliated, soft and the texture feels great. I'm breaking out less and my skin just feels better. This is a nice dupe of the Clarisonic but it's way more affordable at the price of $49. I've tried cheaper versions before that didn't add up. I like that this is more of a vibrating tool rather than a fully rotating/spinning brush head which is too harsh on the skin. The actual brush head/bristles are also very nicer than some of the cheaper options. It also comes with several other attachments - normal brush head, sensitive brush head, exfoliation brush head, hydration head and toning head. Honestly, I just stick with the sensitive brush head but I want to try the normal one for exfoliation. I do wish it came with a charger because right now it's battery operated, but i'm sure that would make it more expensive. You can find these products at www.siriusbeauty.com retailing at only $49. FTC Disclosure: Product sponsored for giveaway. The company has provided an affiliate link for sales associated with purchase. I was not paid to review this product. These are my honest thoughts and opinions. I'd love to win this brush! I've been apprehensive to try a brush on my face because I have sensitive skin. This one has so many attachments I'm sure I could fall in love! Oh my gosh, iv been looking for something cheaper than the Clarisonic! I bought one from Sally beauty supply (don't rmr name) but it didn't work that well! Ever since I turned 30 this year my skin needs more help! I'd love to win this and add it to my skin care regimen. Thank you! It's very nice! I think it isn't sold in Turkey, and I would try it. I'd love to win this brush because my combination skin could use some RELIEF and TLC! I follow your blog, twitter, and adore your Old School Ren bright makeup looks. I would love to win this! I've been wanting try something like this out! I sometimes have really dry skin when the weather changes and this would help me out! thank you! I'd love to win this brush! I have very dry skin so exfoliating is crucial for me, but most products & brushes are too harsh on my skin. This brush sounds like it could be just what I've been looking for. I would like to win because my skin is vey dry and coarse and would love to have something like this to really soften it up! I also heard products like these can get rid of acne! I would love to win, because my acne prone, but sensitive skin needs some serious help. I've tried the Nuetrogena Wave thinkin it might be a cheaper alternative but it didn't do anything to help my troubled skin. Please help...the skin sonic would be a life changer for me. I've been wanting something like this for a while now. But I've only been really serious about it recently. I don't know what it is but my face has been a hot mess. It may be stress, humidity or something else. But I need some help and I think this may be it. Also I've been trying out some long wearing foundations to try to cover up my break-outs....man those are hard to get off. That may be contributing to my mess too. Do you have any suggestions/recomendations to help me get them off at night (I have oily non-sensitive skin). Thank you so much for all of your reviews. OMG this is an awesome giveaway!! Your on a roll girl!!! I always take ur reccomendations and always end up very pleased!! I would LOVE to try this out!!! I am all about taking care of my skin and it helps the way your make-up application!! IM SO EXCITED!!! PICK ME!!! lol <3 thank you ren!! This is my fave of your Giveaways! Would love to win this! I've heard so many great things about similar products and would love to see if this would improve the appearance of my skin! Turned 35 this year and need whatever tools, potions, etc., to keep my skin looking young. HA! Oh I'd love this. I've been thinking about trying one of these. My skin is oily and prone to breakouts, but I also get flakiness. I think this would help. I'd like to win because some years ago I had some similar from Phillips, but it broke 2 years ago :(. I would like to win this because it will help me with my morning and night face washing regimen. To get my skin the way I want it to be is a process. There are lots of trial and errors. I think if I win this it will bring me a step closer to where I want to be with my skin. I would most likely break out less and have just smoother cleaner skin. Thank you for doing this giveaway. I would love to win this brush because I have been looking for a cheaper alternative to the clarisonic that works. Now that gettin older (2 more years i will be thirty OMG) Im all about taking care of my skin the best way possible. I would love to win because I have acne & scar tissue on my face. Entering in this contest in the hopes of winning a better complexion. I would so love to win this as I have always had problems with my acne prone skin since a teenager. Being I have large pores and little blackheads around my nose area & cheek this would be great exfoliation equipment for it. I sure would be using it everyday. I would love to win because I have been eyeing the Clarisonic for quite some time but simply cannot bring myself to justify the cost. 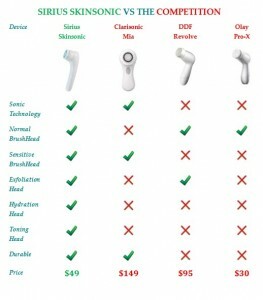 I have heard so much about the Clarisonic and how great it is, but it´s also so very expensive. This is an awsome substitute. I have the clarisonic and love it. I have not used it in a year...I cant justify spending $49 on just a replacement brush. So I would love to win this. Thanks again! SUCH AN AMAZING GIVEAWAY ! I HAVE NEVER TRIED ANY CLEANSING BRUSH BUT I HAVE HEARD GREAT THINGS ABOUT THEM . I HAVE SOME BLACK HEADS AND MY SKIN IS COMBINATION SO THIS WOULD BE IDEAL TO CLEANSE MY FACE . Oh wow! I would love, love, love to win this brush because I'm in search of a dupe for the Clarisonic! I've seen many dupes, but none really compared to the Clarisonic. I trust your judgement and knowledge of this product, so even if I don't win it I'm going to buy it! I'm obsessed with all shincare products and this one is amzing! I bet it leaves your skin so fresh! I would love to Win this item! i have been your biggest fan and you are one of my biggest inspirations to follow my makeup dreams! i would never be able to afford an item like this myself but would live to try it out! I'd love to win this because I've been thinking for a long time about spending the money to try out a brush like this, but I've always been afraid of not liking it and then being quite a bit of money out. OMG! I'm in dire need of a product that will thoroughly cleanse my skin. I've heard some good reviews about the Sirius Skinsonic and I would love to get my hands on this one! I'm sure my skin will look flawless after using this great cleansing product along with some makeup! Thanks again for sharing! I'd love to win this brush because it could help me with my breakouts during summer. I follow your blog religiously and you are my makeup & skincare inspiration! I would love to win this brush, because I have been going through a "rough patch" recently with my skin. And from what I hear the Skinsonic could solve my skin woes! Hi Ren Ren!! I love your blog and you keep me inspired to keep on forging ahead in my freelance work :) I would LOVE to win becasue I just had a baby (2 months ago) and it seems nothing on me is the same- including my skin. I would love this to polish and smooth out my skin after the ride its been on during my pregnancy! I would like to win this cause I always wanted to try something like this but they are so expensive. I've wanted the Clarisonic for the longest but was wayyyy to pricey for my budget. This is a way better alernative. I would love to have it! I would love to try the skinsonic...I'm dying to have clear skin! Thank you! I'd love to win this brush because i never had any experience using this kind of brush to exfoliate my skin... This is my chance to try the brush.. I'd like to win because I'd like to try something new for my skin. I've wanted to try this since you reviewed it! I have very temperamental skin that breaks out randomly, when I'm stressed and don't have time to relax. I'd love to give this Sirius Skinsonic a go! THanks for this awesome week of giveaways! I've never had the extra money to try out a brush like this, so I'm excited to get a chance to win! Cool! Been researching for a while, this product may fit the bill. Thanks, Ren! You are very generous with your giveaways, as it IS your bday so you should be showered with gifts instead. I would love to win this brush as i have wanted try it out for a while now. thank you. I would love to win because I've been wanting a Clarisonic but can't justify the price! I'd love to win because this weekend is my birthday and this would be the perfect present. I would like to win because I've been wanting to try the Clarisonic for so long now and have had my eyes on it. I just read your review and thought it was so cool that you found a cheaper alternative that works just as well, and would love to try it!! Hiiii RenRen!How u doing?Great i hope.. I would love to win this because it's hard to find in my country.. and I'm crazy about this Sirius Skinsonic!!! Thanks... and have a wonderful weekend!! having combated acne and pigmentation for the last 5 years, i want to maintain this new skin with a product that is great for cleansing. 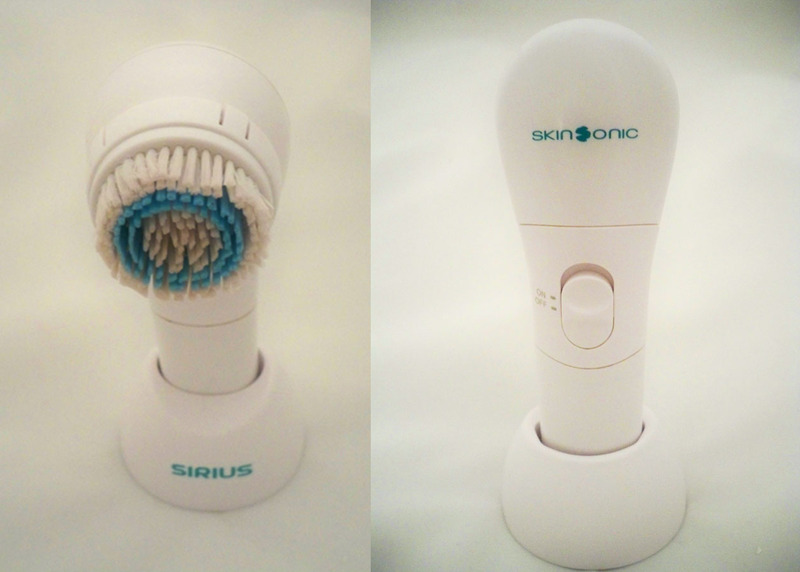 I'm Sirius Skinsonic takes cleansing seriously as I do with several attachments and great price to boot. Thanks!! I got so excited to see that you were hosting this giveaway. I have acne prone,oily skin, that peels as a result of the topical medication I use. I would like to win this so that I can properly exfoliate my skin and reduce breakouts. Thank you for hosting this giveaway. I have horrible skin and am in need of something like this. I do believe it would help my skin improve. OMG!!! I would love to win this and try it out heard so much about the different kinds out there. Thanks again Ren hope you had a fun filled birthday month!!! My skin is so bad right now that it would be great to try this product. Thanks for this giveaway. I want to win this bcz i have some open pores on my face that really need to clean with that . I wish to win this. I would love to win this brush because sensitive but flakey skin needs some help. wow I've heard SO much about this - I can't afford a clairisonic and it seems to work wonders - I'd love to win! hi! I'd like to take care of my skin better so id like to win this! New follower and I’d love to win because I have oily skin, break out easy. I heard a lot about this product & would love to try it, plus I can’t afford it. I'd like to win this brush to help make my skin smoother. I'd Love To Win This Product Because I Have Oily / Combination Skin & My Pores Have Been Messed Up Due To Using St. Ives Apricot Scrub.. That Made My Pores Get Bigger & Prone To Let Dirt In & Cause My Skin To Become Dull. I Want My Old Skin Back!! I would love to win this Skinsonic because I've been wanting one for awhile. I have dry skin & this would help me exfoliate. I would like to win because I have never used a brush like this before and am very interested in trying one out. Honestly my skin been trying to stay in control n I bead to teach who is in control! Thank you! I would love to win this bc i've just always wanted one! I've been wanting to try the Clarisonic Mia for a while now after reading all the reviews but I just couldn't do it on my post-graduate no-income. This would be a wonderful alternative to try! I would love to win bc I've been waiting to try the Clarisonic for a while and just couldn't afford to make the purchase. I need to add a super intensive cleanser to my routine. would love to win this as i want to improve my skin condition!! I would like to win because Clearsonic is too expencive for me :( thank you ! 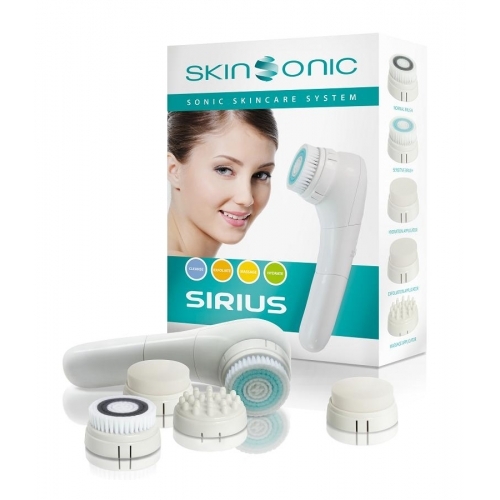 I would love to win this Sirius Skinsonic cause as I have gotten older I notice that my face breaks out now. I have combination sensitive skin so it is sometimes difficult to figure out what works best. I follow your blog via Google Reader and GFC (Michelle G). I'd love to win this brush because I have sensitive and combination skin and I really need something that helps me deal with it. I've been wanting a Clarisonic but I can't afford it =(. Thak you for this giveaway! I would like to win because I am still recovering financially after a messy divorce, and now in my "new life" at forty, I am getting to do a lot of beauty routines that my ex would have disallowed as he thought the only reason women did things like this is to attract guys. Yes, a controlling man. i'd love to win the skin sonic because as i've been maturing and becoming aware of my skin i notice some problem areas that i would like to keep under control. I would love to win this. I've always had normal skin, no shiny t-zone or major breakouts but lately since moving to los angeles from chicago, my skin has not been looking at its best. I would love to win this because my skin has been going through a lot lately. Life has affected my skin this year and this product seems to really cleanse the skin better than my hands. I would love to win because I want to try this so bad!! i'd like to win this brush because my skin has been breaking out soo much ever since i started college! i've tried changing my skincare products but nothing has helped so far :/ thanks for doing these great birthday giveaways! I'd love to win this because my skin badly needs something like this to improve my skin. I've been chronically pestered by blackheads and for years I have been seeking a product that can help me out. Hope this helps. Because it's just so expensive I would want to give a try and see the difference it would make on my skin! What a beautiful wedding. Congratulations to the bride and groom. The children look so sweet. Thanks for sharing their happy day. Fashion photographer in boston ma.